Shoe shopping can be a total buzzkill for anyone. It can be hard to find shoes in certain sizes. It can be even harder to find shoes in some of your favorite colors. 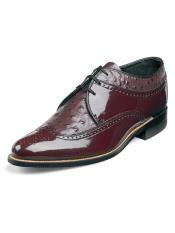 If you're shopping for burgundy shoes for men in person, you may find yourself in a bit of a rut. Quality burgundy shoes for men are becoming more and more of a rarity. 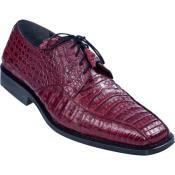 It's even more difficult to find quality burgundy shoes for men that are also affordably priced. Try that! We have an easy solution for you right here at MensItaly, though. That solution is to browse our incredible options. 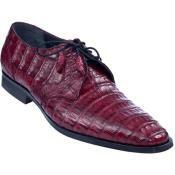 We make finding the best choices in burgundy shoes for men a total breeze. 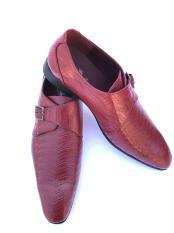 We carry burgundy shoes for men in all sizes. They come with all sorts of exciting and interesting features, too. 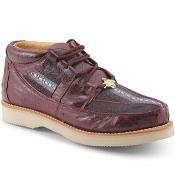 If you're shopping for burgundy shoes for men, you'll love our contemporary and cool offerings. We have burgundy shoes that come with eyelet lacing. We have burgundy shoes that come with split toes. 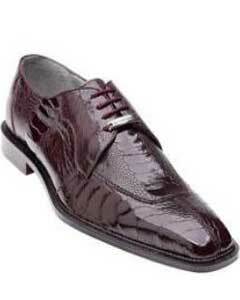 We even have burgundy shoes that feature combinations of different tones. Men who want to wow the world with footwear style that's unsurpassed can always believe in our incredible selection. We can help you find burgundy shoes that will look fabulous with your favorite double breasted suit. We can help you find burgundy suits that look amazing with all of the finest mens suits online. We enthusiastically cater to all style preferences here. Our staff members also offer our customers amazing and detail-oriented fashion advice and guidance whenever necessary. 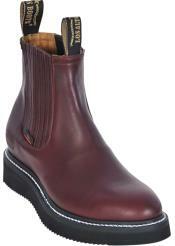 If you want to find burgundy shoes that will flatter your beloved mens purple suit vest, we can assist you. If you want to purchase burgundy shoes that will look wonderful under all of your most stylish mens dark purple suits, we can assist you as well. MensItaly is a retailer that always focuses on affordability. It doesn't matter if you're shopping for elegant mens dark purple suits or if you're shopping for suave and debonair mens purple tuxedo vest & suits. Our products are inexpensive to the max. Don't assume that it's impossible to find inexpensive burgundy shoes, mens dark purple suits and mens purple tuxedo vest & suits on the Internet. It most certainly isn't. MensItaly is a shop that has bargain prices on all of the best designer suits out there. Our suits definitely don't look fit for the bargain category, however. We give our shoppers access to burgundy shoes, mens light purple suits and mens purple tuxedo vest & suits that look and feel top of the line. We don't settle for anything less than that, end of story. 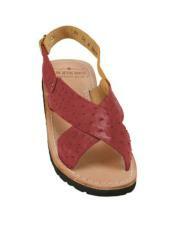 Our shoes are made using some of the finest and most durable materials on the planet. 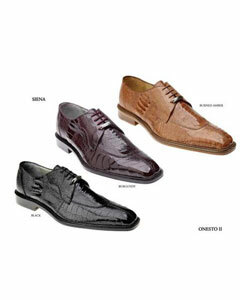 Customers can turn to us for all of the greatest choices in ostrich, stingray and crocodile skin shoes. 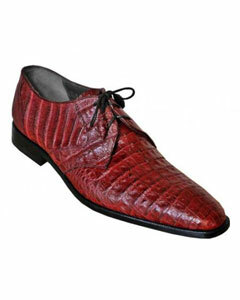 If you want to buy the perfect pair of eye-catching caiman shoes, you can believe in our shop completely. We don't ever let our customers down. We give them what they want exactly when they want it, too. Our focus isn't solely on classic burgundy shoes. 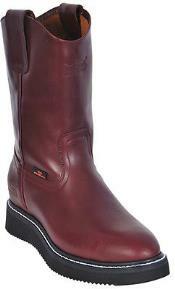 That's because we also offer our customers plentiful choices in attractive burgundy boots. If you're shopping for burgundy footwear that's fitting for a tough and taxing work environment, you'll adore our choices in boots. 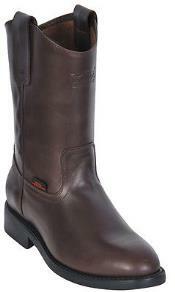 Our work boots are tough, dependable and strong. They're also attractive. 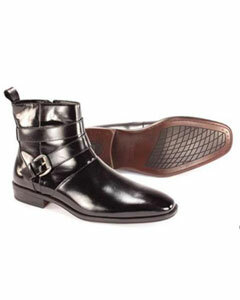 They come in styles that are suitable for all men as well. Customers who are looking for great burgundy shoes and amazing mens double breasted purple suit offerings can visit MensItaly today for more.